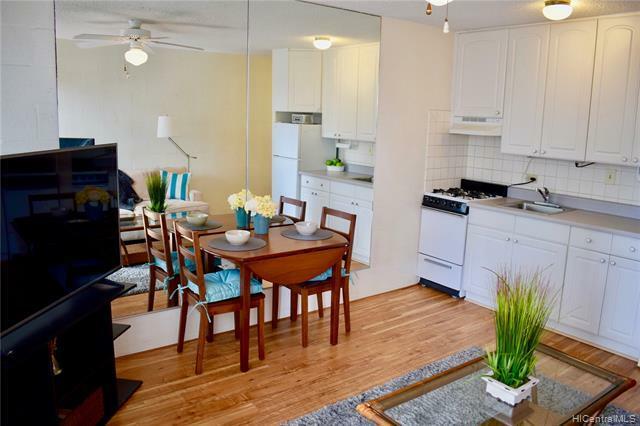 Great location at the beginning of Waikiki and comes with one parking stall, close to beaches, shopping, restaurants, grocery store, side street away from the heavy traffic. Pool, resident manager. Comes fully furnished with kitchenware; turn-key and ready to move in. Clean unit with new flooring. Maint. fee includes utilities except phone and cable TV. Each floor has community laundry. This is the best prices 1 bedroom leasehold property in Waikiki. Call or email today to schedule a showing! Open house Sunday 02/10 from 2-5PM. Listings provided courtesy of Sun Properties Llc.